ASK THE EQUINIST: Trying to go Barefoot...What am I Doing Wrong? Articles and commentary by equine journalist Susan Kauffmann. Topics may include horse health, training, welfare and anything else related to horses. QUESTION: I've been trying to transition my horse from being shod to going barefoot for over a year now, and I'm wondering if I should just give up. I have a professional barefoot trimmer coming every six weeks, she keeps the heels low and the toes short, says his angles are all at the measurements they should be, and she trims away excess sole to improve concavity. I soak the horse's feet for an hour every day, as she recommends. I'm trying to do everything right, but my horse keeps getting abscesses and seems more sore now than when I first took him out of shoes. I don't know what else to do and am thinking of putting his shoes back on. We never had these problems when he was shod, and I'm starting to believe that maybe he just can't go barefoot. I know you have a special interest in barefoot hoof care, so I would like to get your thoughts on this. Thank you. ANSWER: I'm sorry you are having such difficulty, Lori, as you are obviously a diligent and caring horse owner. I hate to say this, but I think the problem may be the style of trimming and hoof care your trimmer was taught to do. Your story sounds eerily familiar, as I once knew a woman in a very similar situation to yours. She had two horses, both of the breed called the Canadian. She had a barefoot trimmer working on her horses, and both were abscessing regularly and so sore that she had not ridden either one much for two years when I met her. This was shocking to me, as Canadians are generally "gravel-crunching machines" with feet like tempered steel. I asked her who her trimmer was, and when she told me, I immediately knew what the problem was: her trimmer, while a lovely person who truly meant well and believed she was doing the right things to help horses, had learned a very invasive style of trimming that has caused many, many people to give up on keeping their horses barefoot because, like you, they think their horses "just can't handle it". I begged this woman to consider trying a different trimmer, a good friend of mine whose methods would allow her horses to heal and develop as they should. She agreed, and when my friend took a look at her horses, she could barely contain her outrage when she saw what damage the previous trimmer had done. Later, in private, she told me, "That damn trimmer took off so much live sole that the poor horses' coffin bones are nearly coming out the bottoms of their feet -- you can actually see the outline of the bone bulging through. It's no wonder they can barely walk!" My friend explained to the owner that you should never remove live sole -- the horse needs this material for protection, and the thicker the better. When you thin this, you weaken the entire foot, leaving the horse extremely vulnerable to developing the kinds of cracks and bruises that so often lead to abscesses. She also pointed out that you cannot -- absolutely cannot -- create concavity by carving it out from the bottom. Concavity is something that develops naturally as the whole hoof capsule, interior and exterior, becomes tighter and healthier -- and even then it will only develop to the degree that is natural based on the shape of that horse's internal structures. She then made an analogy: "Let's say that for some reason, it was a good thing to be bow-legged, and you took a person with straight legs and tried to turn them into a bow-legged person by carving off their calf muscles. That person might look bow-legged, but the bones are still straight underneath. When you carve off live sole on a horse, you create an equally false appearance of concavity, but all you've done is weaken the sole." So, when you talk about your trimmer removing "excess sole", I am worried she may be removing live sole and actually causing your horse to be sore. I will also tell you that Gene Ovnicek once told me that he feels trimmers who use such invasive methods should be put in jail for cruelty to animals. He then said, "I've literally held the bones of the horses they've maimed in my hands, when the bones have come through the bottom of the foot because of their continual carving away of the live sole. It's criminal." Another problem may be the daily soaking you've been told to do. This practice is also taught by the same people who advocate removing live sole, and it is equally problematic. Pete Ramey once told me that the healthiest feet he had ever seen, hands down, belonged to a herd of horses on a ranch in Arizona -- and these horses got their feet wet maybe a couple of times a year when it rained. This started him thinking about external moisture and hooves, and over the years his observations have led him to conclude that external moisture is the enemy of a healthy hoof. Hard, dry, well-developed hooves tend to be the ones you most often see on the horses that float over rocks like they are not there -- and these horses are also not prone to thrush, abscesses, or many of the other problems that are far more rampant in moister climates. So, to make a long story a bit shorter, I would really encourage you to ask around for another trimmer, and to stop soaking your horse's feet. The moisture will only encourage cracking and bacteria -- and thus the continual abscessing. I would also recommend that you check out Pete Ramey's website: hoofrehab.com , and read up on how to use hoof boots to help your horse transition to barefoot. The last thing I would like to say is that these "angles" your trimmer talks about are not necessarily what your horse needs. Dr. Bowker of the Michigan State Hoof Lab says that there is a natural variability in these angles, and that trying to force every foot to conform to some preconceived ideal is a mistake. Please keep in mind that there are widely varying opinions out there on how to trim and care for a barefoot horse, and what I've said here is just my own. However, as I said to the lady with the Canadians, "While a fool will keep banging his head against the wall in an attempt to go through it, a wise man moves on to a different spot and eventually finds the door." Oh, and just to let you know: under the care of my friend (no trimming of the live sole, no soaking), the two Canadians became sound almost immediately and never had another abscess. They are now both the "gravel-crunching machines" they should have been all along, and the owner literally wept in my arms, as she felt so guilty that she had "tortured" her horses for those two years by using that other trimmer. I told her not to blame herself -- she simply didn't know any better, but now she does. Please let me know how things go with your horses, and good luck! As we mentioned in the last installment in this series, the knee of the horse is a complex structure that is subject to a great variety of conformation faults. Today we’ll take a look at three knee deviations, all of which are best observed from a lateral (side) view. For this installment of our new series on conformation faults, we spoke to Charles Hutton, PhD, an instructor in breeding management at Murray State University in Kentucky, and owner of Nu Chex To Cash, an NRHA Million Dollar Sire, Multiple World Champion and World Champion Sire. Dr. Hutton has a particular interest in applied equine genetics and conformation. 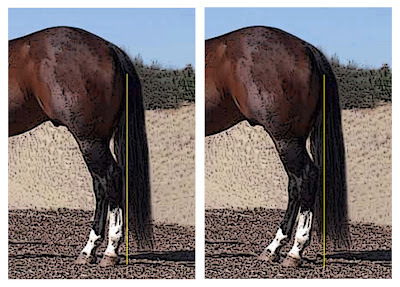 Small hock angles, also known as sickle hocks, is a conformation fault in which the point of the hock lines up under the buttock correctly, but the canon bone angles forward so that the horse is standing under from the hock down. In profile, the leg appears to curve forward, giving it some resemblance to a sickle. This conformation places the plantar (rear) aspect of the hock under great stress, predisposing the horse to sprain and strain of the soft tissue structures that support the back part of the hock. Most experts agree that any horse with hock angles of less than 53 degrees is sickle-hocked. This article was first published in EQUUS magazine. A group of researchers, farriers and other experts argue that restoring basic hoof function and getting a horse moving again are the best ways of addressing navicular problems. Joey, a handsome sorrel Quarter Horse, was a standout in the Houston Police Mounted Patrol unit. “We’d had Joey since 1996 and he was the very best horse we had, able to go into any dangerous, high stress situation and lead other horses in tactical formations,” says Officer Greg Sokoloski, who trains the patrol mounts. Four years ago, however, the gelding’s place on the force was in jeopardy. After initially showing soreness in his left front foot, Joey began to move like a horse in pain, taking progressively shorter strides and landing toe first. Rest and medication had no effect, and, finally, x-rays confirmed bone changes consistent with the chronic heel pain known as navicular disease.